This project, like the real allotment, just grew and grew, but unlike the real one, which is always extremely well disciplined, it got a bit out of hand. It all started in 2009 when the ‘Knit a Veg’ stall proved a great success, attracting knitters young and old to try their hand at creating a variety of produce, encouraged by allotment volunteer Helen Hudson, who had previously made a knitted veg window display for Terre à Terre restaurant. Several group members were keen to form a knitting group to extend their skills, eat cake and have a laugh – rather like Sunday work afternoons on the allotment in fact! The idea was not only to make something entertaining and good to look at, but something that would demonstrate the variety, productivity and beauty that’s possible on a well thought out allotment. In keeping with the spirit of organic gardening, most of the materials that were used were left overs, donated or found in charity shops. “The design conforms to the actual layout of the beds, paths, pond, gravel and recreation areas. We have allowed some artistic licence, but we’ve included as many of the types of veg, fruit, herbs, flowers and trees that are grown there as we could knit in the space. The more permanent plantings are in the positions they really occupy. Other areas have herbs like thyme, sage, rosemary and feverfew, while the long border below the pond has a variety of useful small trees and shrubs of which buddleia is shown. “In keeping with good organic practice, the contents of the raised beds are rotated each season. We also thought it important to show how flowering plants are used as companion plants and to attract insects for pollinating and pest control, and judging by the size of the knitted bees, butterflies and ladybirds, and the health of the crops, it’s worked! 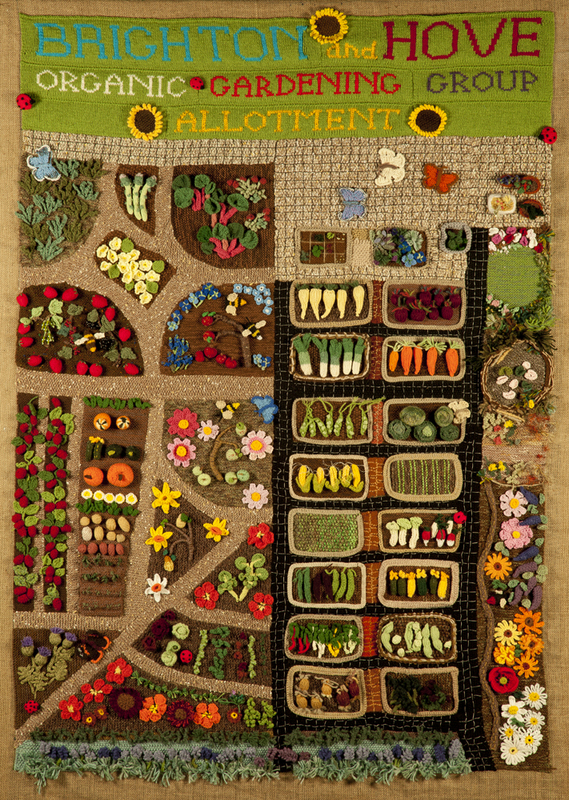 Look out for the knitted allotment near you! We’re happy to bring the knitted allotment out and about – it’s a real talking point and helps people appreciate the skill in plotting a real allotment too. At 6ft by 4ft, it suits a public space such as a gallery or community centre. It’s designed to be easily removed from a supporting frame, which is in sections to make transportation on a bike possible. If you’re interested, contact us! Previous What is organic gardening?